"He was a charming character who saw the beauty of the world through his wonderful clear blue eyes. His ability to create was endless." --Florence Knoll Bassett Here is the fascinating story of Bertoia Studio, where Sound Sculpture was invented and new ideas of what art is were developed. Harry Bertoia (1915-1978) was the brilliant artist and Metal Craftsman at Cranbrook Academy of Art who made Ray and Charles Eames' wedding rings before he joined them in Califiornia to help design a chair Charles was working on. He then went to Knoll Associates and made his famous Bertoia chairs. Like Alexander Calder and George Rickey, Harry Bertoia used natural movement to inspire his sculptures, and he added sound. For 35 years he produced a tremendous volume of work, including fascinating graphics, domestic-size metal sculptures, and large major commissions in cities throughtout the world that people love today. Harry Bertoia was joined in the 1970s by his son, Val Bertoia, who continues to invent and create new kinds of sculpture. 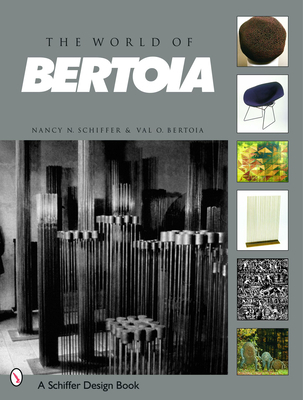 This book documents all the types of original work made at Bertoia Studio from the 1950s to the present. Over 500 photographs show the Bertoias' evolution of ideas that explore the relationships of space, color, and sound. Art collectors have been passionate in their praise and enjoyment of Bertoia's work for over fifty years.